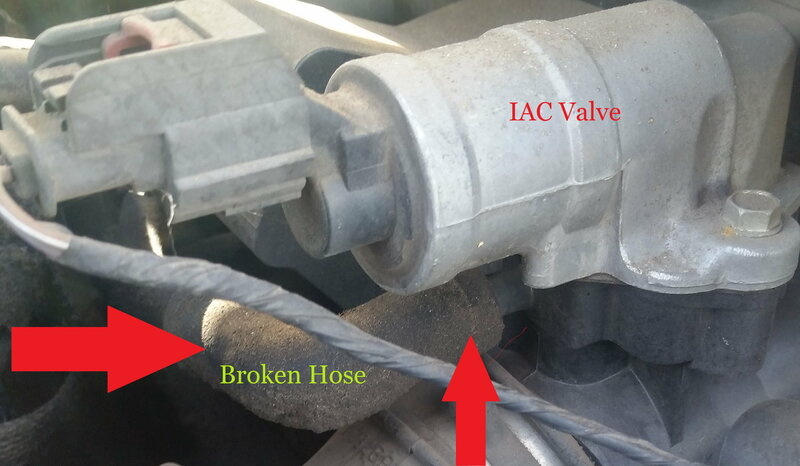 I noticed the hose beneath/connected to my iac valve has deteriorated. Which is probably the cause of idle issues with my car. However, I can't find a part number or name to look for a replacement. I've seen where it connects and it looks like something I can do myself if I can just find the right part. If you can tell me what look for I'd appreciate it. A pick would help. Is it a rubber line? Take it to an auto parts store and match the size up to some rubber hoses they have. Usually buy it by the foot. bump? I did post a pic if that helps I don't know if it's a generic rubber line or not is the problem. Stop by an auto parts store and see if they can source the part or offer an alternative. I got the two pieces off and went by both autozones in town. The old tubing is thin and quite stiff, they said all they had was the soft tubing and that it might be a problem. Is that true? And am I correct in thinking that the black part beneath the IAC valve is part of the throttle body? I used oil resistant hose, like for a trans cooler. mine was split too, lots of vacuum leak. yeah, it's the throttle body. after the stupid dealer parts guy told me the wrong part (it's not a crankcase breather hose). some more digging found that the pipe it connects to goes to the purge solenoid. The pipe is apparently part of the vapor harness.